Register: FREE — It’s a very simple procedure too. Earn: A Statement of Accomplishment, but no college credit. Prerequisites: None. Designed for the under-grad. Format: Videos (15 to 20 minutes each) and short readings per topic. Repeat: Rewatch the videos and reread the readings as often as you like. Quizzes: Typically 8 questions, multiple choice. Take when you’re ready. Retake: To improve your score on any test, you can retake it … twice! Participation: There are opportunities to take part in a forum if you’d like. Professor Hornstein teaches what is known as “positive law” (what the law actually is) as opposed to “normative law” (what the law ought to be). He is an outstanding teacher. The course imparts insight into how lawyers and judges think and reason with regard to environmental law. It does not specifically address wild horse and burro issues. But the information is still relevant for our purposes. For instance, one of the first topics covered is “nuisance law.” On the surface, it might not seem applicable to our advocacy. But wait — don’t the wild horses and burros get blamed for being nuisances when they step outside the invisible boundaries of their herd management area? So, understanding “nuisance” as a legal concept — determining what is and what is not deemed a nuisance according to the courts — can make us better-able to defend our clients. Advocates who have reviewed and responded to BLM environmental assessments will already be familiar with many of the terms, concepts, and laws that are discussed. Dr. Hornstein has many teaching assistants that help him. They are eager to answer questions. Also, you will find that students from all over the world, not just America, take the course. Last term, there were reportedly about 20,000! Yes, twenty thousand! A special thanks to Marybeth Devlin for bringing this class to our attention. 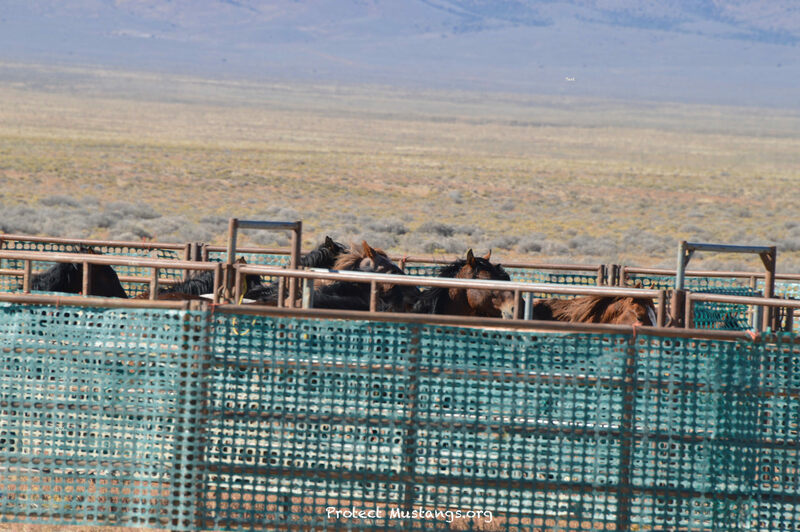 Both wild yearlings, Blondie and Tibet, had 2-Strikes from failed Bureau of Land Management (BLM) adoptions. 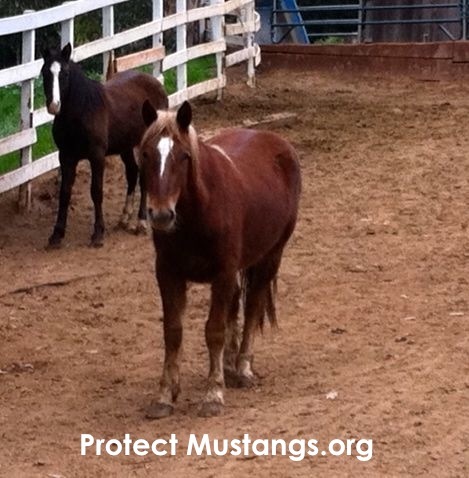 Protect Mustangs stepped in to prevent a 3rd Strike and save them from sale ($10 each by the truckload) and probable slaughter. Blondie is the soon to be 2 year old palomino filly from California’s Fox Hog herd. Tibet is the 18 months old gelding with a blaze from the Continental Divide in Wyoming. 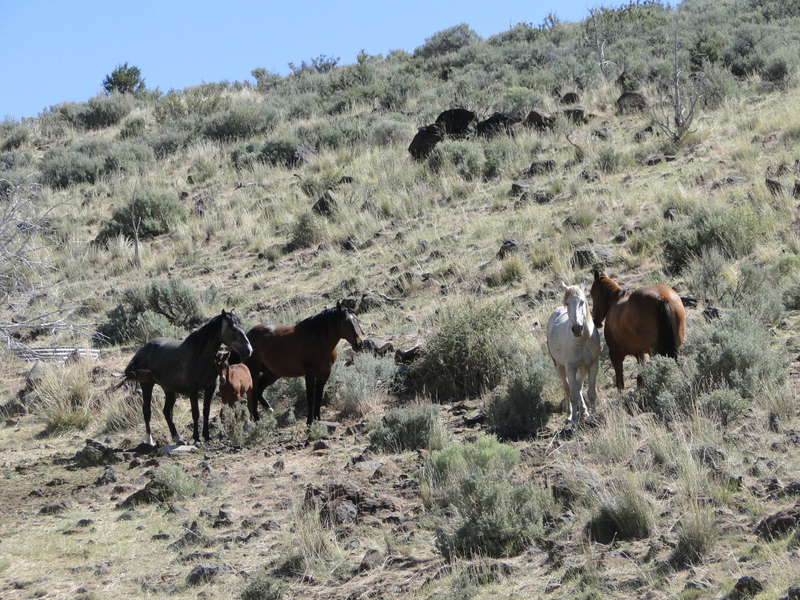 Blondie arrived untamed from the Litchfield BLM Holding Corral in December 2012 and Tibet arrived from the Wyoming Corral in February 2013 thanks to our village of supporters. Now both wild horses are gentled. They have been exposed to cars, trucks, helicopters, people riding horses, kids, dogs, cats, kids on scooters, tarps and more. They can be haltered, pick up their feet and be lead. This is their second turnout in the main arena at the training facility. Anne Novak has donated their training. No treats were used during this training session. 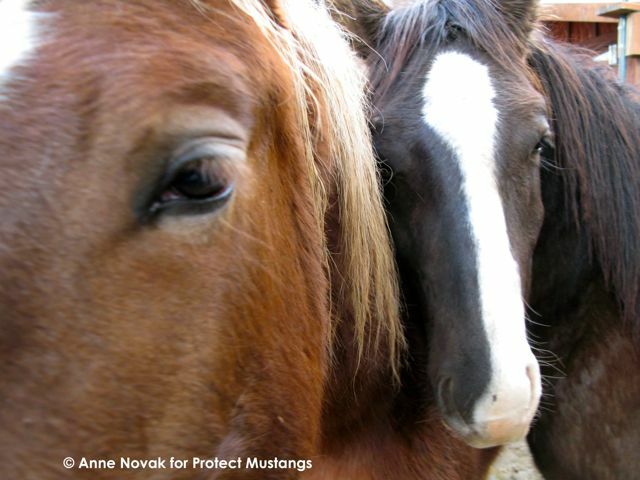 All images © Anne Novak for Protect Mustangs.org, all rights reserved. 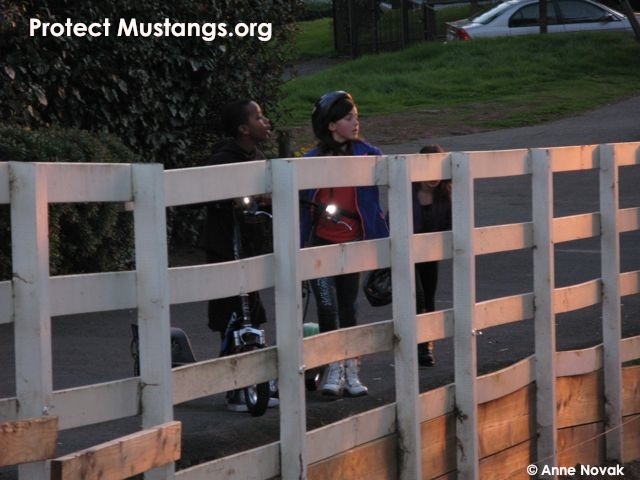 Neighborhood kids check in often to watch the wild mustangs. They ask a lot of questions.